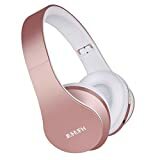 For those who want to skip details, here are my recommendations for wireless TV headphones that are cheap with good performance and that can be purchased for less than $50. The primary feature of the Mpow Bluetooth headphones is the impressive quality of sound performance. This headphone has passive noise isolation properties and not active noise cancellation. As much as it does not completely cancel the sound, it will not drown the battery and destroy the quality of the sound. Additional to the sound quality factors, it produces better quality than the ANC headphones. The closed-back design gives it immersive Hi-Fi sound with 40mm driver and CSR chip together. The manufacture of this headphone is done with the memory-protein ear cushion that simulates the human skin texture to enhance a feeling of comfort. It also has a soft padded headband and a stainless steel slider that will allow you to find the perfect fit without straining and give excellent durability. In a single charge, you are assured of thirteen hours of continuous music and fifteen hours of talk time because it has a built-in 420mAh battery on the wireless model. The wired model, on the other hand, you will have to use the cable to listen to music. Thus, it will not go off for as long as you are using it. Note that the microphone only functions in the wireless model. 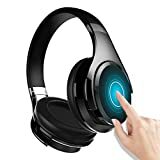 These headphones provide a stable and quick connection with Bluetooth enabled devices like tablets, PCs, TVs, Cell Phones, with their inbuilt microphone for their hands-free calls. It also has a foldable headband for saving your desk space and for easy carrying. It has a memory protein ear cushion that simulates the human skin for a better feeling. The internal battery in the wireless model and the cable in the wired model makes sure that you have a continuous flow of music and hands-free calls. The foldable design is easy to carry because it uses less space and smaller bag to secure portability. The quality of sound from these headphones is high. Depending on your ear size and shape, you might have a tight feeling in the ears. The Mpow Thor Bluetooth headphones have a CSR chip and 40mm large-aperture driver unit to provide a fast transmission speed, better audio output, and lower latency. If you would like to have a better experience with your Hi-Fi stereo music system, you will have to diversify music volume and genres in the sound test and make sure that you have the ear cushion seal around your ears. The padding is done with a soft memory foam and the flexible ear pads wrapped by the protein leather to simulate your skin texture. Its lightweight nature also reduces the pressure it applies on your head and ears. Its retractable headband helps you to find the most comfortable way to wear it. The Bluetooth connectivity in the headphone makes it pair fast and stay stable with any of your device that is Bluetooth enabled. It also possesses a battery that lasts for more than eight hours when playing music and requires three hours to full charge. 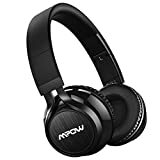 The Mpow Thor headphones also have an additional port that makes use of the provided audio cable for connecting to the source of music to avoid running out of charge. You will not have any more worries about missing a call while away from your phone because you will receive or hang calls with the buttons on your headphones. The foldable design can be a good short travel item because you will not require a large bag for transporting it. The CSR chip and large aperture driver unit provide an excellent audio output, lower latency and fast transmission speeds. It has a protein leather wrapping that simulates your skin for enhanced comfort. It is lightweight in nature to reduce the pressure it applies on the head and ears. The Bluetooth connectivity remains stable, and pairs fast with all enabled devices. The battery gives more than eight hours of non-stop music. The zealot B21 has an easy to use touch interface that allows intuitive gestures control interface for music playback and volume. You will just have to swipe backward or forward to switch within the tracks and up or down to adjust the volume. These headphones come with a pair of soft ear cups to give you long-lasting comfort while isolating and canceling background noise. It has a foldable design that ensures maximum mobility because it is only ten OZ. You can carry it to any place that you want at any time. It delivers a stunning quality of sound. The sound produced is deep, crisp, powerful sound that that has a stunning bass impact. It also features an inline remote or microphone for calls and music. The inbuilt lithium battery can run it for twenty hours nonstop, and you can recharge it using the USB cable that comes with its package. The careful leather selection makes the zealot b21 both luxurious and stylish to age beautifully. It has an intuitive gesture control interface for its volume and music playback. They have soft ear cups for giving your head and ears comfort. It has an inbuilt lithium battery that can last for twenty hours while playing. 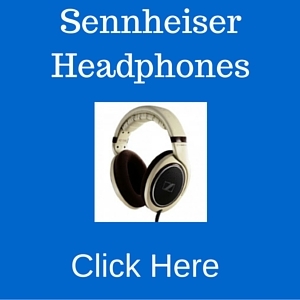 These headphones are not perfect for noise cancellation as they allow for noise interference. These wireless headphones produce an amazing stereo kind of sound quality. This headphone delivers passive noise isolation and not active noise cancellation. 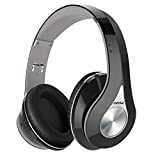 The ear hugging design it possesses also offers an immersive stereo sound. 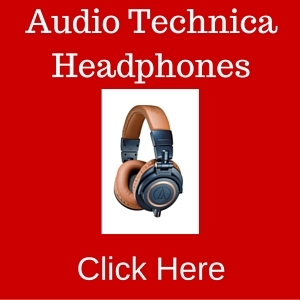 The audio quality is the most important aspect when selecting a certain brand of headphones. Watching talk shows and listening to music on the iPod with this device is okay. If you love listening to metal, the sound quality is just fine with this selection . The bass output is great, and the performance satisfies the individual that is listening. The noise cancellation is not one hundred percent… you can hear a kid screaming. Just like all other headphones, the design of this headphone is adjustable to fit all people using it. All the controls are on the right side only, even the charging port and the audio port. The design is foldable and with a lovely color for saving space on your desk. It also enhances the convenience of portability when storing it in the bag while traveling. It has a headband that extends to suit all sizes of the head plus soft memory earmuffs for getting comfort to your ears. It produces perfect audio sound quality when you are listening to music and talk shows. The Bluetooth connectivity is quite strong in the whole house and yard while doing your work. The headphone is adjustable to fit well on your head and ears. The design is foldable to save space while traveling and at your desk. The Dylan Bluetooth headphone has advanced capabilities because it comes with an inbuilt, industry-leading, and advanced CSR Bluetooth 4.1 chip. It brings with it a better audio experience, lower latency, and clear quality of communication. The design of this headphone is foldable and retractable to provide you a convenient way of carrying it around in the travel case. You can enjoy your music while moving. This headphone produces a high-quality Hi-Fi stereo performance as a result of its large forty millimeter aperture driver unit that skims skip-free music with crystal clear treble and extra bass. It is one hundred percent not compromised. It also possesses high-capacity rechargeable batteries that can run close to eight hours of nonstop functionality on full volume. 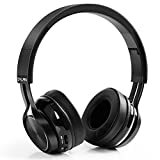 This set of headphones is the most comfortable because it has a retractable headband and soft protein leather ear pad that lifts the load from your ears. You will not experience discomfort after listening to the music for an extended period. It has advanced Bluetooth functionality that brings about the clarity of communication, lower latency, and a better audio experience. You can enjoy listening to music while at any place because it is retractable and foldable. It has a rechargeable battery that can give up to eight hours of continuous listening on full volume. There is no discomfort while listening to music for an extended period. Not real cons for the price, the quality is great given the price but obviously inferior to headphones made for audiophiles.